Bajaj Majesty RHX Duo Plus is a 1000 watt portable room heater. 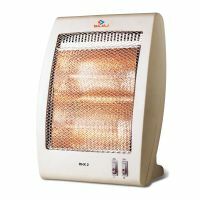 This room heater comes with two heating elements and features an adjustible thermostat for maintaining the desired temperature by tweaking the average power just by turning off the heater after the threshold level. It also has a durable body designed from high quality materials. To Recieve updates and possible rewards for Bajaj RHX-2 Halogen please sign in. To Recieve updates and possible rewards for Room Heater please sign in.